Located along US Highway 61 in the central Mississippi Delta, Mound Bayou was at one time the nation’s largest and most self-sufficient African American town. Founded in 1887 by cousins Isaiah T. Montgomery, Joshua P. T. Montgomery, and Benjamin T. Green, all of whom had been slaves at the Davis Bend Plantation in Warren County, the initial settlers of this once-storied community carved out a productive and prosperous standard of living in the midst of what had been for most African Americans of the period a uniquely treacherous and unforgiving part of the American South. The prototype for Mound Bayou was the former Davis Bend Plantation, which under the administration of Joseph E. Davis, older brother of Jefferson Davis and a devotee of Robert Owen’s theories regarding the cultivation of a labor pool, allowed for the creation of a versatile, self-sufficient, cooperative, and pragmatically educated workforce. The Montgomerys and Green gained expertise from their slave-era experiences that served the budding town they helped establish: Isaiah Montgomery and Benjamin Green in business matters and Joshua Montgomery in the practice of law. In July 1887 Isaiah Montgomery was commissioned to serve as land agent for the Louisville, New Orleans, and Texas Railroad, which sought to build passenger rail links through the heart of the Delta region but desperately needed towns to create a customer base. Although primarily focused on white settlers, railroad officials also sought to exploit the heretofore untapped possibilities provided by black laborers looking to establish their own communities. This search ultimately led the railroad to recruit Montgomery and a handful of other African American agents. Once all involved agreed on an exact location for the Mound Bayou settlement, in the hinterlands of Bolivar County near the Chickasaw burial mounds some seven miles west of the Sunflower River and fifteen miles east of the Mississippi River, Montgomery set out in search of potential settlers. The first wave brought members of his extended family and included both Joshua Montgomery and Benjamin Green. Isaiah Montgomery eventually targeted other former Davis Bend residents, many of whom had worked both with and for the Montgomerys. He later traveled to other parts of the Deep South to entice former slaves to come to Mound Bayou, where they would engage in the all-too-familiar clearing out of swamplands but would now do so for their own benefit. As a result of his inspired planning and recruiting, Montgomery developed an enviable revenue stream from a combination of commissions and land sales, and as settlers poured in from throughout the region, Montgomery and Green founded the town’s only sawmill, another boon for the family coffers. Under any other circumstances, Mound Bayou, nicknamed by its residents the Jewel of the Delta, would have been deemed an unmitigated success, but as an African American venture in the center of Mississippi’s most productive plantations during the peak years of Jim Crow, its accomplishments were nothing short of miraculous. 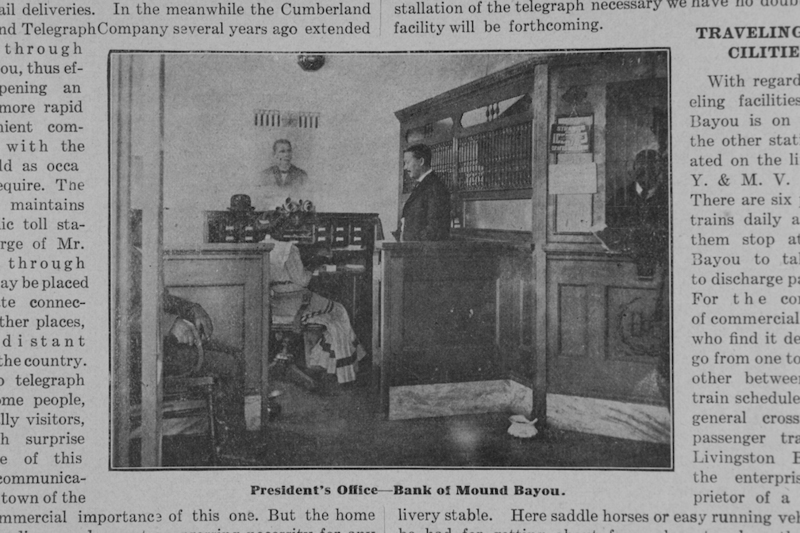 At a time when few Delta communities could organize themselves effectively, Mound Bayou, through the work of another astute businessman, Charles Banks, developed a thriving business infrastructure complete with a governing body, banks, merchants, cotton gins and warehouses, and a public school system, all outside the reach of the surrounding white-dominated towns. 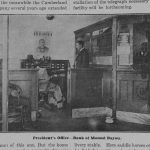 These successes began to draw notice from around the country, as Booker T. Washington, Theodore Roosevelt, Andrew Carnegie, Julius Rosenwald, and other noted figures became de facto supporters of the town’s vast enterprises. 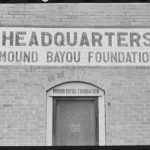 In 1942 Mound Bayou became home to the central Delta’s first hospital when the Knights of Tabor, a progressive African American fraternal order, built a forty-two-bed facility staffed by physicians from the Meharry Medical School in Nashville, Tennessee. 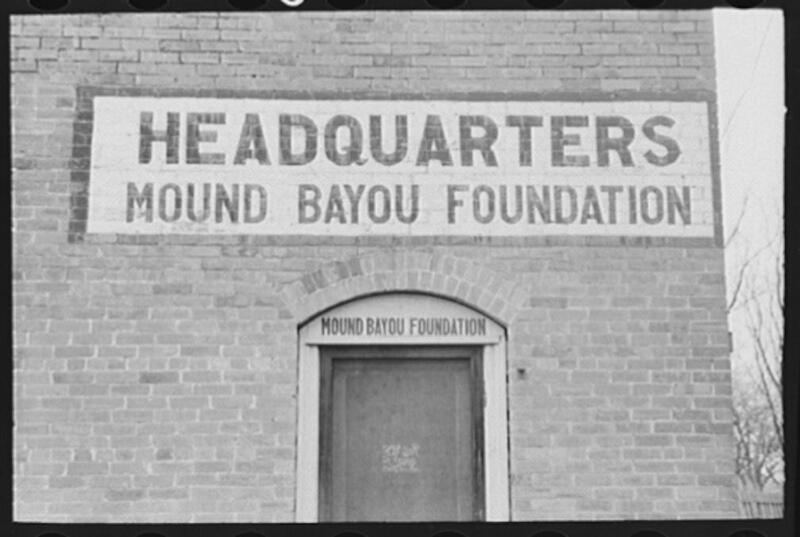 With the hospital, schools, parks, and a small but impressive array of African American professionals, Mound Bayou offered hope, examples, and a central location for many African Americans in the Delta. The second half of the twentieth century was not nearly as kind to Mound Bayou. As an oasis from white-run politics and white-owned business, it was a safe place for some civil rights leaders, especially early in the movement. But a series of business setbacks, fluctuating markets, mounting antagonism from surrounding areas, and severe political infighting began to wear away at its legacy, and by the late 1960s the once proud and self-sufficient town had been reduced to the level of many other small, struggling Delta communities. Though it remains a part of the Delta landscape, it has yet to regain its status as one of the region’s most successful ventures in town building.